Congratulations December Pike grads (l-r) Nick Kollasch, Dylan Gust, Matt Lillard and Troy Szymanski. 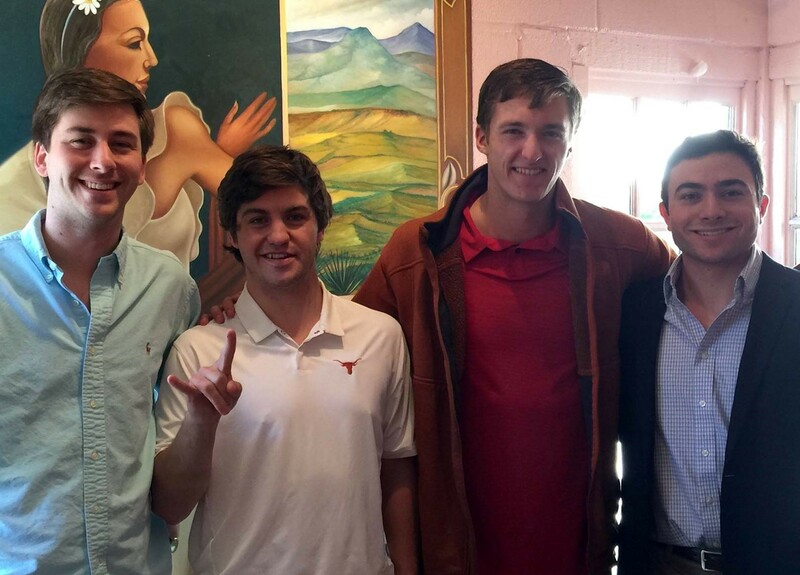 Austin alums traditionally host a Senior Send-off lunch for December and May graduating Pikes. Honored on December 7 were: Sean Dunn (Marketing), Kevin Elwood (Biology/PreMed), Dylan Gust (Chemical Engineering), Nick Kollasch (Radio-TV-Film), Kevin Lillard (Economics), Jon Lutz (Actuarial Science) and Troy Syzmanski (Computer Science). The Pike Alumni Fund provided Pike fleece blankets as graduation gifts to these seniors. Best wishes to these new Texas-Exes and Pike alums!